Three couples, a single man and a single woman, board the “African Sun” cruise ship in Fort Lauderdale, Florida for its annual trans-Atlantic repositioning cruise to Barcelona, Spain. Through a circumstance of twisted providence these eight passengers become the fascinating diners who will break bread together every evening at a very special ‘table for eight’ in Le Cordon Bleu, the cruise ships main dining room. They are not the typical tourist types that the world’s luxurious cruise ships generally host. They all have their own secret, self-serving, and for some, life threatening personal issues that need to be sorted out during the cruise. There is the casino financial manager who has stolen a large sum of money and is now running from the Mafia; a beautiful hitwoman hired by the Mafia to get the money back and kill the thief; a Duke and Duchess from a long defunct Duchy in Eastern Europe running from the authorities because of Ponzi schemes and fraudulent investments they have created; a U.S. Representative and her consultant husband, both violating the laws pertaining to campaign money, and who are members of a secret “one world government” organization; and a retired IRS couple with big personal problems. It is when they join each other every evening for dinner that the mystery and intrigue they are living plays out. Two other individuals are involved with this group, a police detective who has been ordered to kill the casino thief, and a private detective whom the FBI hired to protect the casino thief. The web of conspiracies amongst all these people creates endless conflict and turmoil. The story illustrates how eight plus disparate passengers deal with the life-and-death traumas and complications they have to face. It is suspenseful, entertaining, cynical, heavy with satire, and rich with humor. It is a classic action thriller, however one that lampoons society and life in general through the adventures and actions of some very interesting and ruthless dining companions. And for the romantics among us, despite all the intrigue and adventure that takes place on the cruise, love still finds a way to become a part of this compelling mystery. This book is available in e-book and paperback on Amazon.com. 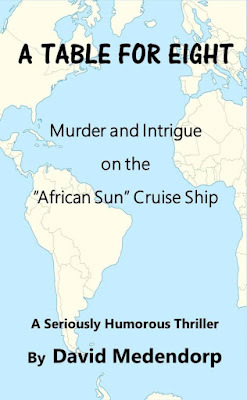 This is the exciting sequel to A Table for Eight – Murder and Intrigue on the African Sun Cruise Ship. 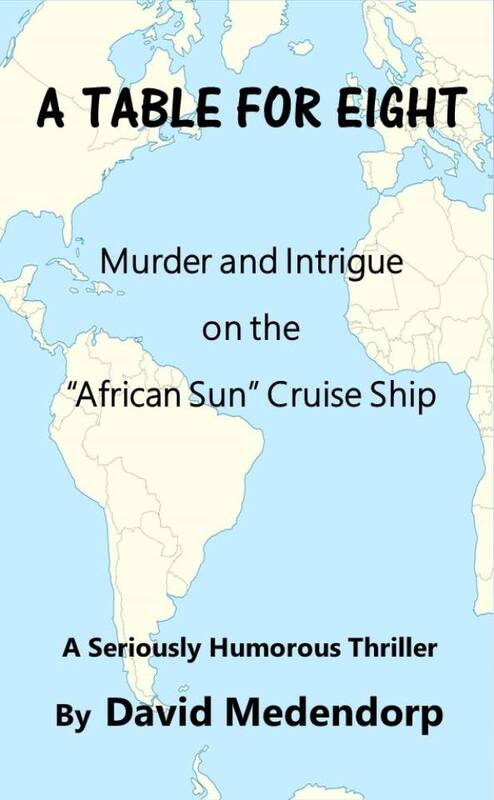 The story begins in Barcelona on the day the African Sun cruise ship arrived and where the sham suicide of Herbert Pennyworth and the killing of the Chinese intruders took place. The action quickly moves into the murky world of international espionage and intrigue as the key players pursue their greed for money, and their desire for revenge. Like the first book, this one is also heavy laden with an endless array of cynical actions and bizarre behavior as the survivors and the pursued engage in a game of international and cat and mouse. Like everything in life, the key motivator is the pursuit of money and personal fortune. David Medendorp My style of writing will be enjoyed by those readers who have a well developed sense of dry humor. I take my characters beyond the realm of reality to my private land of fantasy, and there they bask in my interpretation of people’s thoughts, behavior and actions, all heavy laden with sarcasm and cynicism as they play their assigned roles in my books. The result are stories full of adventure, suspense, and good, albeit slightly bizarre, cynical humor. Generally speaking my books are based on places where I have either lived or visited over the years, and on the kinds of people I have known or met during my travels, and in my private world of fantasy. Writing is the fulfillment of my life. My wife Mary and I reside in Tampa Florida.